Found this book in an antique shop in Albuquerque, NM last Christmas……Yes, Christmas…not….whatever the anti-Christmas folks say…. 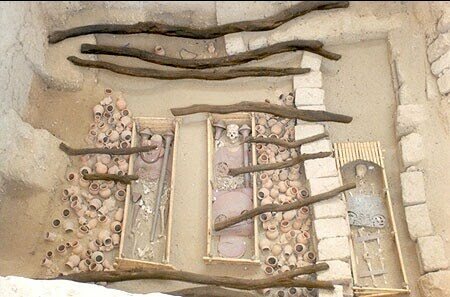 This is a very nicely done documentation associated with the excavation of a Royal Peruvian tomb. The story of the site is rather standard in many ways: locals stumble upon an unknown treasure site by accident, loot it, sell some of the stuff, get caught, cut a deal to identify the source and the officials move in to secure it. In this case, only a relatively small part of the location so the world got lucky. 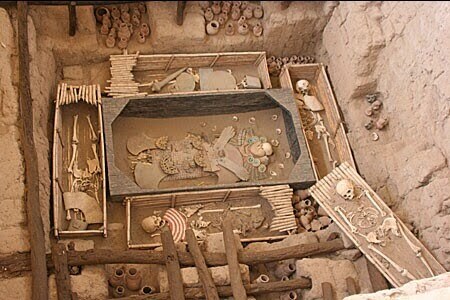 The site is located near the Pacific coast in Peru. The book is both a detailed story of the finding and the subsequent excavations. In addition, it works well as a catalog of the artifacts that were found. While there is not a lot of drama, it is a very well written account of a modern excavation and the things they do. I rather enjoyed it but then I enjoy reading about the amount of detailed work goes into these things. The illustrations are magnificent. What are especially wonderful are the pictures of the materials in the site and the companion pictures showing the same items all cleaned up. The quality of the workmanship in gold and stone is outstanding. Only complaint – the binding is kinda weak and is threatening to break at the spine.